Oh, Google! You're so Googly! 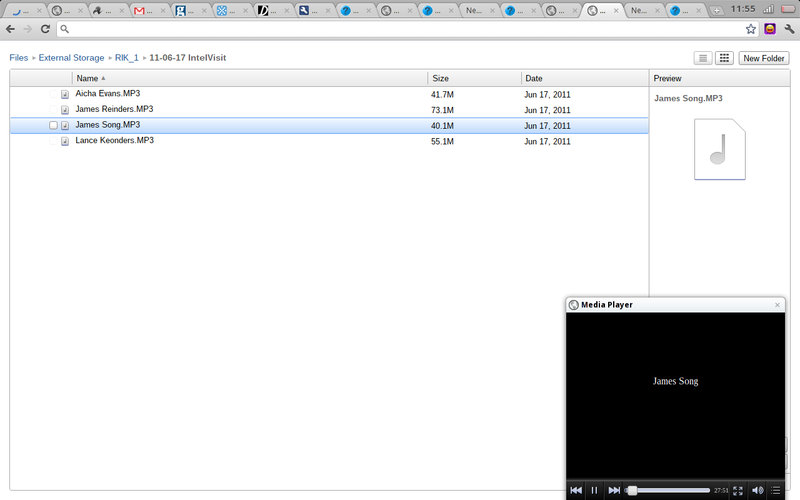 Review The most amazing thing about Google's inaugural Chromebooks is that they come with a file manager. It's not much of a file manager, but it's relatively easy to find, and it gives you relatively quick access to the files you've download, or screenshots you've taken, or documents on a thumb drive you've plugged into the USB port. This may seem like the most fundamental of tools. But in December, when Google released its beta Chromebook, the Cr-48, there was no file manager. And Mountain View was adamant that such a basic piece of software was beside the point. Running Google's Chrome OS operating system, Chromebooks seek to move everything you do onto the interwebs. Chrome OS is essentially a modified Linux kernel that runs only one native application: Google's Chrome browser. You can install plug-ins and extensions, but otherwise, every application you use must be a web application. Rather than run a local copy of Microsoft Office, you use Gmail, Google Docs, and Google Calendar. Rather than iTunes, you use Pandora or maybe the "cloud" music services offered by Google and Amazon. This also means that most of your data sits on the web, inside services like Google Docs. Google pitches the Chromebook as a kind of disposable computer. If you lose it, the company says, you lose neither your apps nor your data. You simply buy a replacement machine, sign in with your existing Google account, and find everything waiting for you, just as you left it. The rub is that the world isn't quite ready for a machine that doesn't give you access to local files. Google admits as much in adding a file manager to Chrome OS, which made its official debut last month with the arrival of the $429 Samsung Series 5 Chromebook and the $349 Acer AC700-1099 Chromebook. Cr-48 beta testers called for a file manager, and Google gave them one. But this file manager is rudimentary at best. Familiar nested folders give you access to downloaded files and screenshots and external drives, but there are few file types you can actually launch straight from the manager. If you click on a .doc file, for example, Chrome OS gives you an error message. It doesn't open the file with Google Docs. The OS now offers a media player for playing MP3s and the like, but this too is the most basic of tools. It is merely in place to wean you away from local files and applications. Google is still very much intent on moving everything to the web. We've used the Samsung Chromebook for the past two weeks, and with the exception of the file manager and the media player and a few other nips and tucks, the basic experience isn't that different from what we saw with the Cr-48. Using a solid state flash drive rather than a traditional hard disk, the machine boots in about 10 seconds. It instantly goes to sleep and instantly revives when you close and open the display. And its security model makes an awful lot of sense. But if you're a consumer, this isn't a machine that can replace your primary laptop. And if you're a business, it is only suited to a portion of your workforce. There are certain native applications that the web just can't duplicate, including design tools and video editors and high-end games. Even fairly mature web applications like Google Docs can't quite match what you get from desktop software. What's more, shuttling files between web applications is still a painful process, and this is eased only marginally by Google's file manager. But the primary problem is that a Chromebook is all but unusable if you don't have an internet connection. Even Google's centerpiece web applications don't yet work offline.